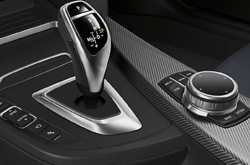 For the 2019 model year, BMW has added a suite of new standard features to their popular 4 Series sedan. Navigation will now be a standard feature, as will be advanced real-time traffic, park distance control, and an improved instrument cluster. Apple CarPlay will come pre-installed with a one-year free trial. 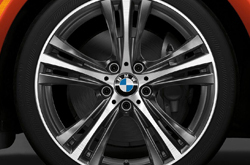 Visit BMW of Springfield today to take a test drive and check out all of these new features. For each of the three 4 Series models - Coupe, Gran Coupe, and Convertible - there are two body style options: Sport and Luxury. Sport includes black high-gloss design elements, while the Luxury opts for chrome accents. The base trim level is called the Simplicity tier. The Convenience tier brings in heated front seats with power lumbar support and active blind spot detection. Things top out at the Executive tier, which provides automatic high-beam headlights, side and top-view cameras, and an innovative parking assistant feature. What Is Under The Hood of the 4 Series? There are two engine options for the 2019 4 Series: the 430i and the 440i. The 430i is the standard engine and it's a mighty inline four-cylinder TwinPower Turbo. Putting out 248 hp and 258 lb-ft of torque, it impressively displaces only 2.0 liters. The 430i goes from zero to sixty in 6.1 seconds. If you need a little more power, the 440i can provide 320 hp and 330 lb-ft of torque from 1380-5000 rpms. It's an advanced inline six-cylinder, also incorporating the most advanced TwinPower Turbo technology. Zero-to-sixty time is 5.1 seconds. xDRIVE, the intelligent all-wheel-drive system from BMW is available for all models, providing the ultimate in stability control. With the 4 Series, safety doesn't have to be sacrificed in exchange for luxury and performance. State of the art safety features included on all models are anti-lock brakes, front and rear head protection system, front side-impact airbags, and an anti-theft alarm system. In order to minimize the damage caused by a collision, BMW has developed an impact sensor that activates Battery Safety Terminal disconnect of alternator, fuel pump and starter from battery; automatically unlocks doors, and turns on hazard and interior lights in the event of a crash. 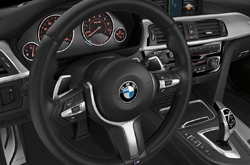 BMW Remote Services are also included, which feature Stolen Vehicle Recovery, Remote Door Unlock, and the BMW Connected App for smartphones.